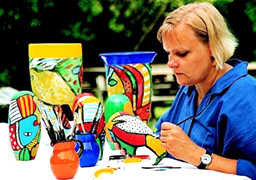 Visit tropical artists in their studios. Opportunity for groups to visit tropical artists in their studios. Would a trip to tropical artists in their studios be something that your group of friends, members of a club or perhaps a business group, would enjoy whilst visiting Far North Queensland?If so, you have come to the right place! Artquest Port Douglas specialises in visits to tropical artists in their studios, which are usually not open to the public. Artists, in general, guard their privacy so that they may concentrate on researching and making their art. Their work-spaces are also often part of their home. So, if our tropical artists agree to open their studio work-spaces to visitors, this is a privilege that we do not take lightly. Six persons is the minimum number for group bookings; maximum for most studio visits is ten persons. However, some can cater for quite large groups, with a gallery situation sometimes being even more suitable. Benefits of group travel can be many. Obviously, it is a good way of keeping costs down whilst maximising value. A group of friends will have wonderful shared experiences to discuss at a later time and often find that they learn more about those friends in new situations. For many, travelling with friends, old or new, means security and support while they make explorative forays into unknown territory. Some groups will start out as strangers - but rarely will they end up that way! The studio visits are designed to be fun and informative. They are also an opportunity to purchase artworks that may never be offered to the general public. In their lush and tranquil location in the ‘forest of rain’, Ola and Marie Hoglund work on their glass art using a variety of techniques, including blowing, fusing, slumping, flamework and painting. A stunning collection of handmade art glass - vases, bowls, platters, goblets, candlestick holders and glass jewellery - is on display in their gallery. Visitors are invited to watch hot molten glass being blown, where light and glass play a mesmerising game with each other in the creation of exquisite art glass. Groups will learn about the history of glass, its composition, tools and techniques. They will watch complex glassblowing techniques and marvel at how easy Ola makes this heavy work seem. Hoglund glass masterpieces, employing techniques such as Arial, Graal, Incalmo and Sommerso, are sought after by glass collectors and connoisseurs worldwide. By arrangement, groups of people may also learn to make their own glass paper weight...a very special souvenir of their holiday! Although small groups are very welcome, Hoglund's Glass Art is also a destination which is suitable for larger groups. Nearby is High Falls Farm Restaurant if refreshments are needed! Tucked away in the peaceful Mowbray Valley, a short ten minute drive from Port Douglas, is Anna Curtis' studio, where she creates her insightful reduction lino prints. A dedicated artist, Anna enjoys the solitude and time for reflection that her comparative isolation brings.Visitors will have much to admire and learn as they watch Anna demonstrate her exacting, but deceptively simple, craft. 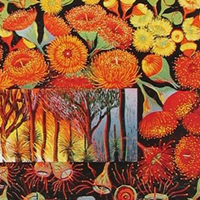 Hers is craftsmanship of the highest order and I count her as one of Australia's leading printmakers in her field. 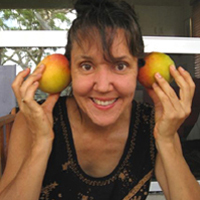 In a lighter moment, Anna shows us the mangoes picked from trees near her studio, so plentiful that they are "coming out of her ears"! During your visit you will see the steps Anna takes in the process of carving lino in a mirror image, of pressing that image onto paper to transfer one colour. Then more carving and another colour is laid down, then another until the image is complete and the block exhausted. Perhaps you will try out the process for yourself. Anna keeps folios of unframed work at her studio and you may browse through these. When you find one that you just can't resist, I am sure that Anna will sell it to you! As with all of our artists, Anna is happy to package work and will even send it home for you.